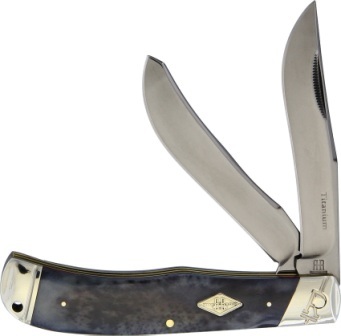 Shop online for trapper pocket knives made in China. 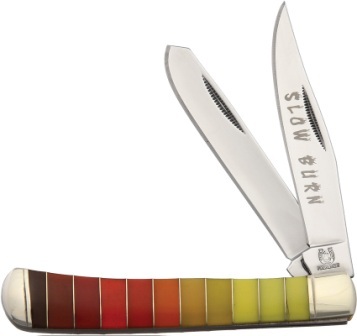 Excellent prices on knives and knife sharpeners. 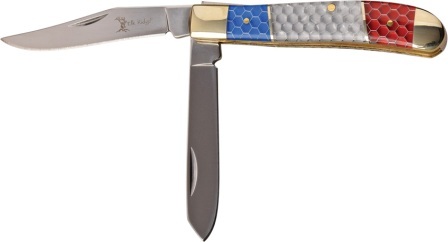 Many limited edition collector series knives available. 4.13" closed. Satin finish 3Cr13 stainless clip and spey blades. Black jigged Delrin handle. Stainless bolster(s). Inlay shield. Boxed. Made in China. 4.13" closed. Satin finish 3Cr13 stainless clip and spey blades. Blue jigged Delrin handle. Stainless bolster(s). Inlay shield. Boxed. Made in China. 4.13" closed. Satin finish 3Cr13 stainless clip and spey blades. Orange jigged Delrin handle. Stainless bolster(s). Inlay shield. Boxed. Made in China. 4.13" closed. Satin finish 3Cr13 stainless clip and spey blades. Red jigged Delrin handle. Stainless bolster(s). Inlay shield. Boxed. Made in China. 4.13" closed. Satin finish 3Cr13 stainless clip and spey blades. Yellow jigged Delrin handle. Stainless bolster(s). Inlay shield. Boxed. Made in China. 2 1/2" closed. 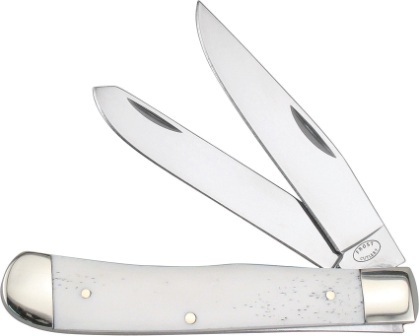 AUS-8 stainless clip and spey blades. Master blade has Yello-Jaket etching. 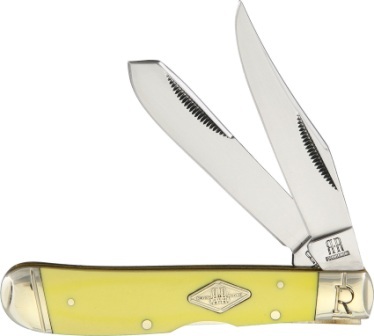 Stainless frame with yellow carbon fiber inlay handles. Wooden storage/display box with Camillus and Yello-Jaket logos etched on lid. Hang packaged. Made in China. 3 1/2" closed. 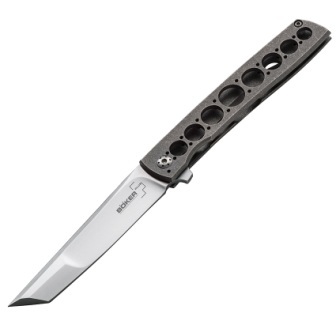 440 stainless clip and spey blades. 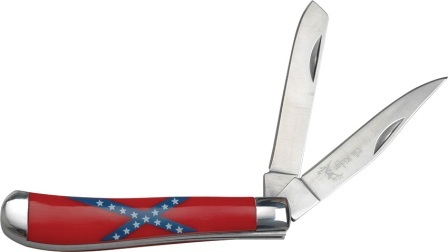 Red composition handles with Confederate States of America flag artwork. Nickel silver bolsters. Made in China. Trapper. 4.13" closed. Mirror finish 3Cr13 stainless clip and spey blades. Nickel silver bolster(s). Black C-Tek handle. Boxed. Made in China. Trapper. 4.13" closed. Mirror finish 3Cr13 stainless clip and spey blades. Nickel silver bolster(s). 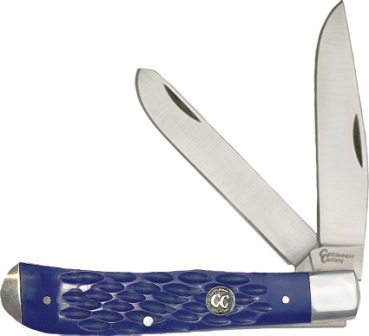 Blue C-Tek handle. Boxed. Made in China. 4.13" closed. Mirror finish 3Cr13 stainless clip and spey blades. Nickel silver bolster(s). 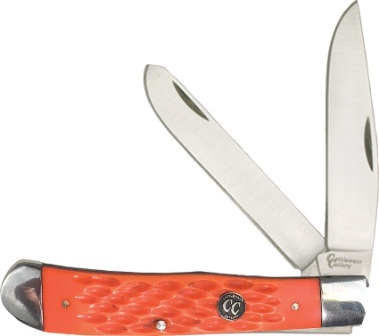 Red C-Tek handle. Boxed. Made in China. 3.5" closed. Satin finish stainless clip and spey blades. Red, white, and blue C-Tek handle. Nickel silver bolster(s). Boxed. Made in China. 3.75" closed. Satin finish stainless clip and spey blades. Brown resin handle. Nickel silver bolster(s). Inlay shield. Boxed. Made in China. 3.75" closed. Satin finish stainless clip and spey blades. Nickel silver bolster(s). 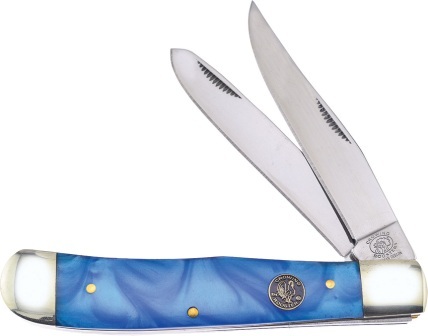 Black and blue stone and mother of pearl handle. Boxed. Made in China. 3.75" closed. 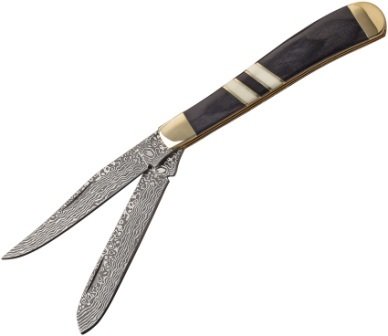 Stainless clip and spey blades with Damascus etched pattern. 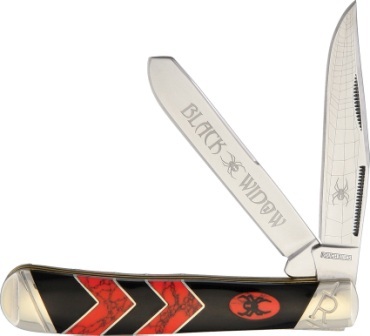 Black pakkawood handle with white bone inlay. Nickel silver bolster(s). Boxed. Made in China. 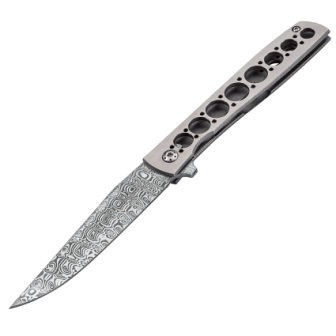 3.75" closed.Stainless clip and spey blades with Damascus etched pattern. Brown pakkawood handle with black pakkawood inlay. Nickel silver bolster(s). Boxed. Made in China. 4.13" closed. Mirror finish stainless clip and spey blades. 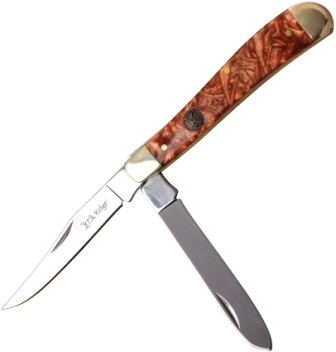 Bone handle. Nickel silver bolster(s). Inlay shield. 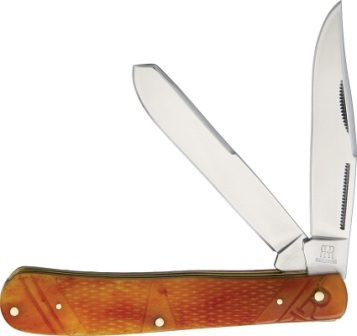 Tennessee peach seed handle. Boxed. Made in China. 3 7/8" closed. 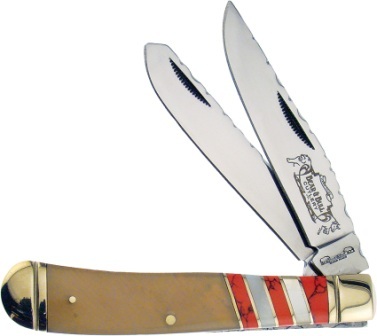 Stainless clip and spey blades. 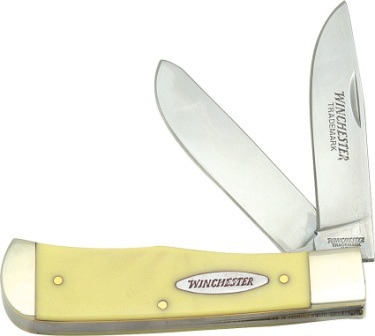 Yellow composition handles with nickel silver bolsters and rifle inlay shield. Made in China. 4.13" closed. Mirror finish stainless clip and spey blades. 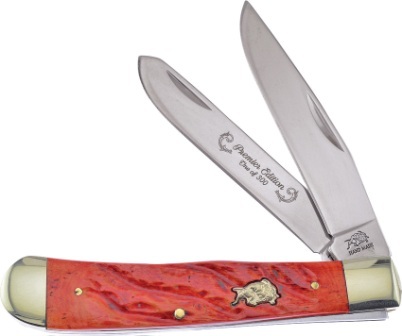 Red smooth bone handle. Nickel silver bolster(s). 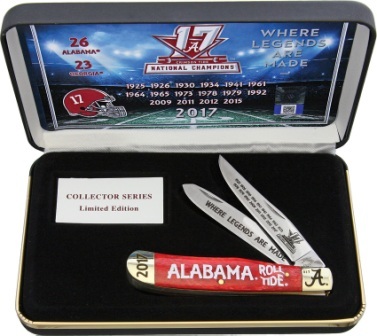 Alabama Championship artwork on blades and handle. Gift boxed. Made in China. 4.13" closed. Mirror finish stainless clip and spey blades. 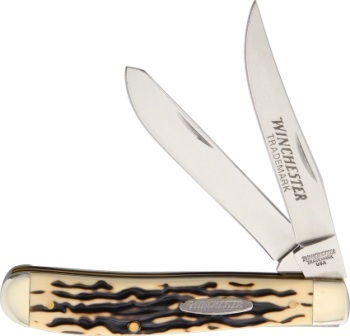 White smooth bone handle. Nickel silver bolster(s). 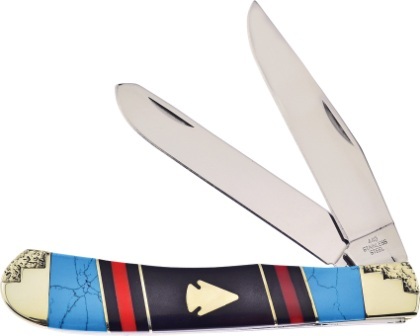 Alabama Championship artwork on blades and handle. Gift boxed. Made in China. 4.13" closed. Mirror finish stainless clip and spey blades. 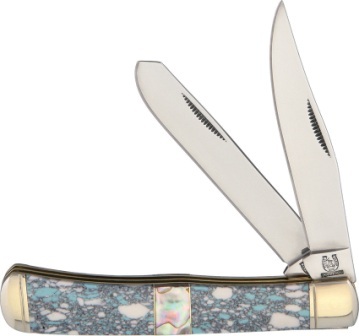 Ox horn handle with mother of pearl inlay. Nickel silver bolster(s). Green pakkawood spacers. Boxed. Made in China. 4.13" closed. Mirror finish stainless clip and spey blades. 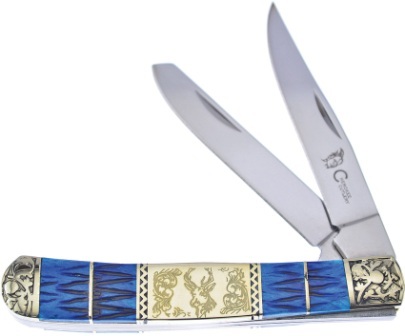 Ox horn handle with mother of pearl inlay. Nickel silver bolster(s). Red pakkawood spacers. Boxed. Made in China. Bulldog. 4.13" closed. Mirror finish stainless clip and spey blades. 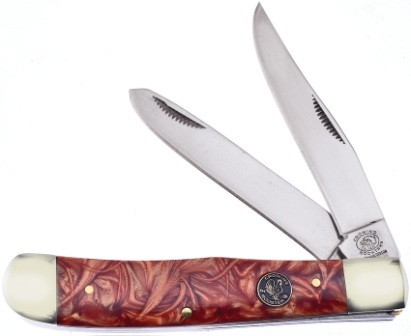 Buffalo horn handle. Nickel silver bolster(s). Inlay shield. Boxed. Made in China. Bulldog. 4.13" closed. Mirror finish stainless clip and spey blades. 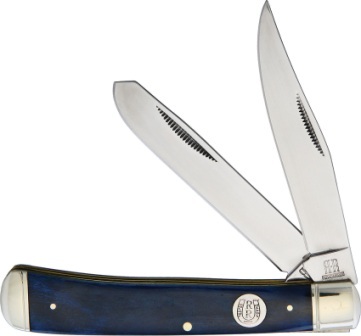 Blue jigged bone handle. Nickel silver bolster(s). Inlay shield. Boxed. Made in China. Bulldog. 4.13" closed. Mirror finish stainless clip and spey blades. Red jigged bone handle. Nickel silver bolster(s). Inlay shield. Boxed. Made in China. Bulldog. 4.13" closed. Mirror finish stainless clip and spey blades. 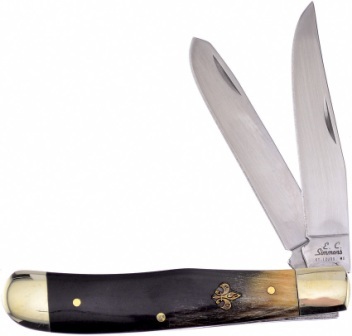 Ox horn handle. Nickel silver bolster(s). Inlay shield. Boxed. Made in China. 4.13" closed. mirror finish stainless clip and spey blades. Brown jigged bone handle. nickel silver bolster(s). Inlay shield. Molasses handle. Boxed. Made in China. Caliber Series. 4.13" closed. Mirror finish stainless clip and spey blades. 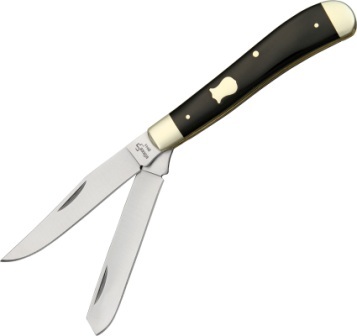 Black pick bone handle. Nickel silver bolster(s). Inlay shield. Boxed. Made in China. Crowing Rooster. 4.13" closed. Mirror finish stainless clip and spey blades. 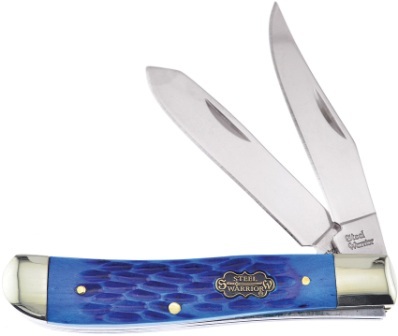 Blue Bayou resin handle. Nickel silver bolster(s). Inlay shield. Boxed. Made in China. Crowing Rooster. 4.13" closed. Mirror finish stainless clip and spey blades. 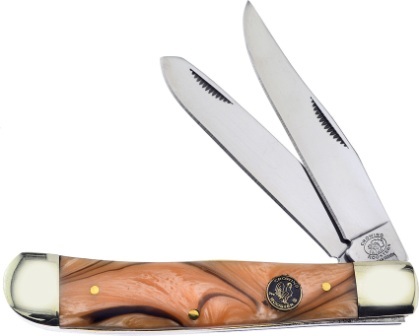 Buffalo horn handle. Nickel silver bolster(s). Inlay shield. Boxed. Made in China. Crowing Rooster. 4.13" closed. Mirror finish stainless clip and spey blades. Gold resin handle. Nickel silver bolster(s). Inlay shield. Boxed. Made in China. Crowing Rooster. 4.13" closed. Mirror finish stainless clip and spey blades. 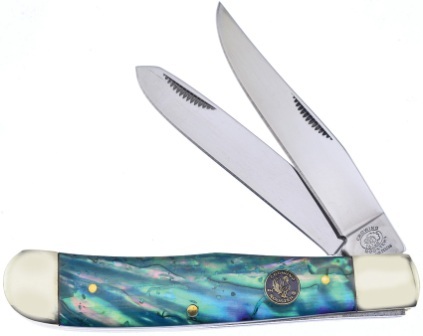 Salt water abalone handle. Nickel silver bolster(s). Inlay shield. Boxed. Made in China. Crowing Rooster. 4.13" closed. Mirror finish stainless clip and spey blades. 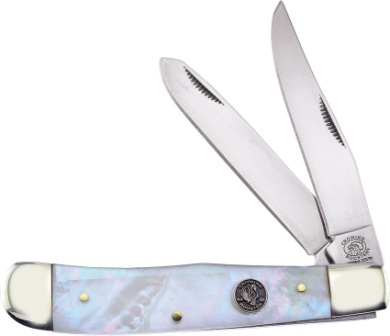 Salt Water Mother of Pearl handle. Nickel silver bolster(s). Inlay shield. Boxed. Made in China. Crowing Rooster. 4.13" closed. Mirror finish stainless clip and spey blades. Whiskey resin handle. Nickel silver bolster(s). Inlay shield. Boxed. Made in China. Crowing Rooster. 4.13" closed. Mirror finish stainless clip and spey blades. Zebra wood handle. Nickel silver bolster(s). Inlay shield. Boxed. Made in China. Cherokee Stone Works. 4.13" closed. Mirror finish stainless clip and spey blades. Black jigged bone handle. Nickel silver bolster(s). Stainless inlay with deer artwork. Boxed. Made in China. Cherokee Stone Works. 4.13" closed. Mirror finish stainless clip and spey blades. Red jigged bone handle. Nickel silver bolster(s). Stainless inlay with deer artwork. Boxed. Made in China. Cherokee Stone Works. 4.13" closed. Mirror finish stainless clip and spey blades. 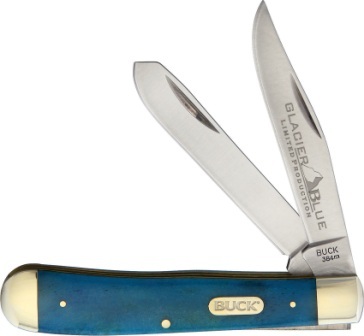 Blue jigged bone handle. Nickel silver bolster(s). 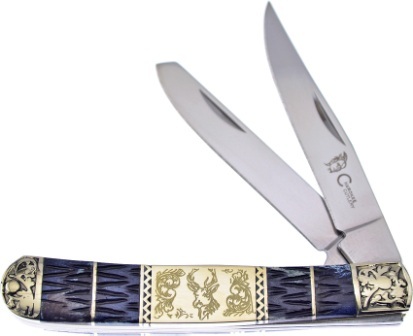 Stainless inlay with deer artwork. Boxed. Made in China. Cherokee Stone Works. 4.13" closed. Mirror finish stainless clip and spey blades. Whiskey jigged bone handle. Nickel silver bolster(s). 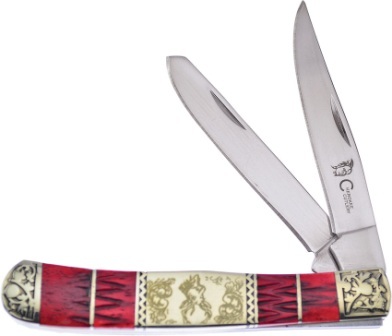 Stainless inlay with deer artwork. Boxed. Made in China. E. C. Simmons. 4.25" closed. Mirror finish stainless clip and spey blades. 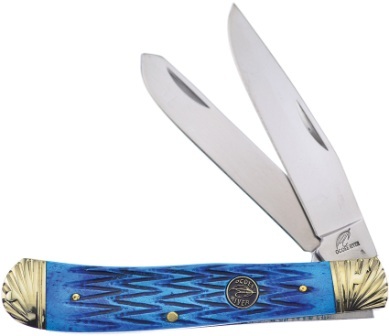 Blue Bayou resin handle. Nickel silver bolster(s). Inlay shield. Boxed. Made in China. E. C. Simmons. 4.25" closed. Mirror finish stainless clip and spey blades. 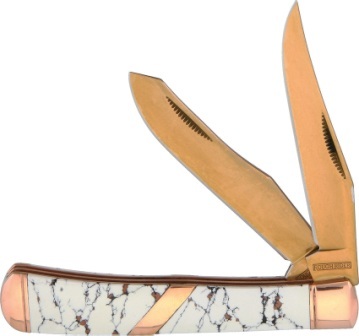 Gold resin handle. Nickel silver bolster(s). Inlay shield. Boxed. Made in China. 4.13" closed. Mirror finish stainless clip and spey blades. Ox horn handle. Nickel silver bolster(s). Inlay shield. Boxed. Made in China. 4.13" closed. Mirror finish stainless clip and spey blades. Zebra wood handle. Nickel silver bolster(s). Boxed. Made in China. 3.75" closed. Mirror finish stainless clip and spey blades. Ox horn handle. Nickel silver bolster(s). Inlay shield. Boxed. Made in China. Ocoee River. Trapper. 4.13" closed. Mirror finish stainless clip and spey blades. 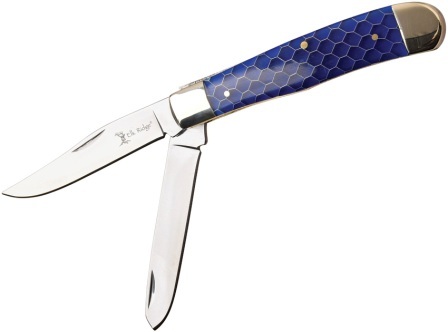 Blue jigged bone handle. Nickel silver bolster(s). Inlay shield. Boxed. Made in China. Ocoee River. 4.13" closed. Mirror finish stainless clip and spey blades. 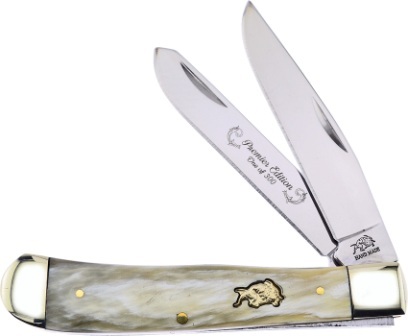 Ox horn handle. Nickel silver bolster(s). Inlay shield. Boxed. Made in China. Ocoee River. 4.13" closed. Mirror finish stainless clip and spey blades. Red jigged bone handle. Nickel silver bolster(s). Inlay shield. Boxed. Made in China. Ocoee River. Trapper. 4.13" closed. Mirror finish stainless clip and spey blades. Nickel silver bolster(s). Inlay shield. 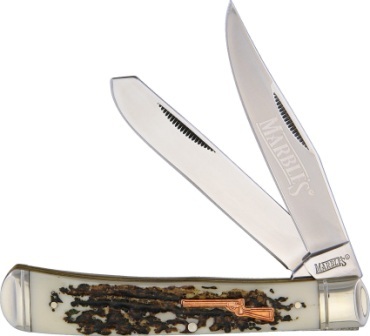 Stag bone resin handle. Boxed. Made in China. 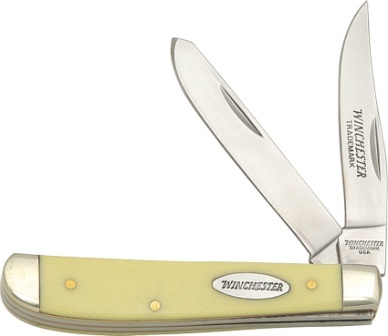 Type: Trapper; Closed: 2.5"; Blade: Stainless | Standard Edge | Mirror Polish Finish; Handle: Yellow | Synthetic; Other Info: Inlay Shield | Nickel Silver Bolsters. Measures: 7 1/2" x 3" x 2 1/2". 1:24 scale diecast model of 1937 Ford Pick-up. Has steerable wheels and rubber tires. Detailed interior, exterior and engine compartment. Made of diecast metal with some plastic parts. 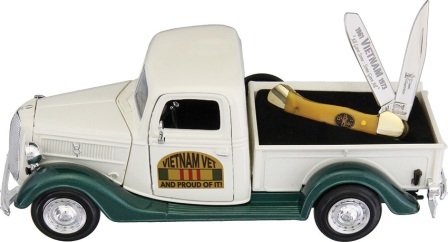 Vietnam Vet artwork on side panel. 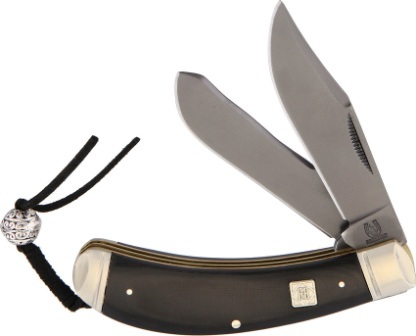 Comes with Mini Trapper pocket knife with stainless clip and spey blades. Boxed. Made in China. 4.13" closed. Mirror finish stainless clip and spey blades. 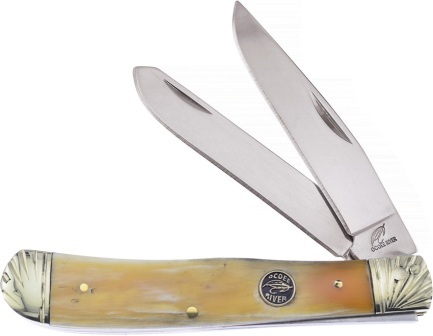 Natural smooth bone handle. Nickel silver bolster(s). Blade etching. 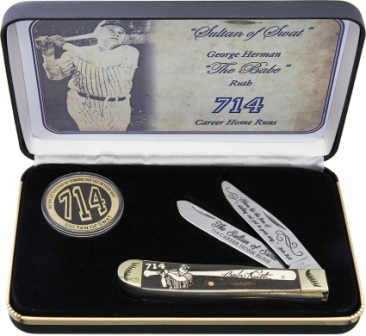 Babe Ruth artwork embossed on handle. Includes collectible coin. Gift boxed. Made in China. Silverhorse. 5" closed. Mirror finish stainless clip and spey blades. Nickel silver bolster(s). Inlay shield. Red, black, and turquoise stone handle. Boxed. Made in China. Silverhorse. 3.88" closed. Mirror finish stainless clip and spey blades. 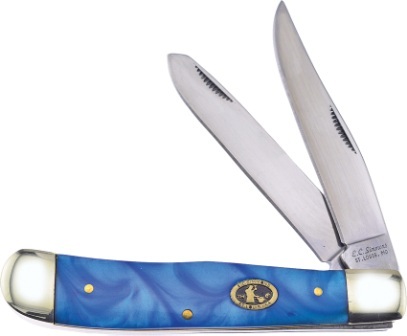 Red and blue lapis and mother of pearl handle. Boxed. Made in China. Steel Warrior. Trapper. 4.25" closed. Mirror finish stainless clip and spey blades. 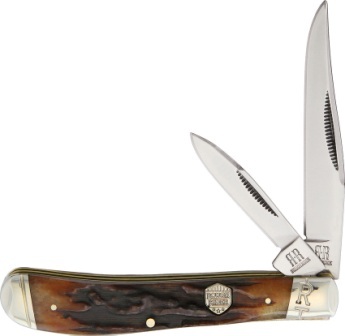 Buffalo horn handle. Nickel silver bolster(s). Inlay shield. Boxed. Made in China. Steel Warrior. 4.13" closed. Mirror finish stainless clip and spey blades. Brown Molasses jigged bone handle. Inlay shield. Boxed. Made in China. Steel Warrior. 4.25" closed. Mirror finish stainless clip and spey blades. 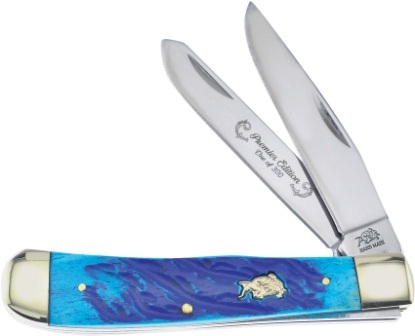 Caribbean Blue jigged bone handle. Nickel silver bolster(s). Inlay shield. Boxed. Made in China. 4 1/8" closed. Stainless clip and spey blades. 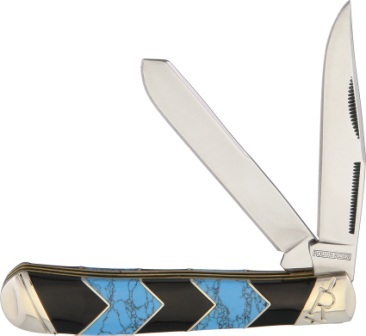 Cobra snake skin composition handles with nickel silver bolsters and coiled snake inlay shield. Made in China. 4 1/8" closed. 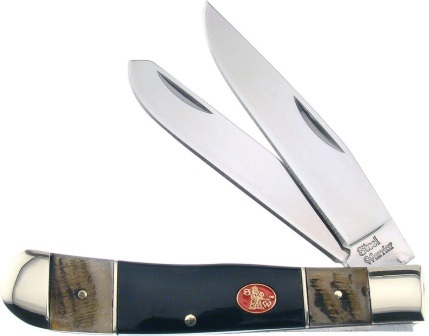 Stainless clip and spey blades. Christmas tree composition handles with grooved Nickel silver bolsters. Steel Warrior inlay shield. Made in China. Steel Warrior. 4.13" closed. Mirror finish stainless clip and spey blades. 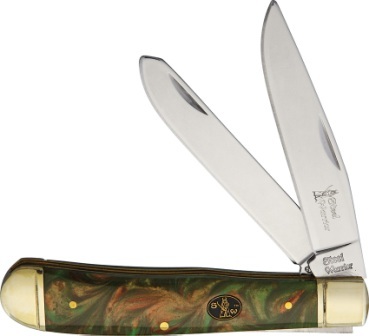 Gold abalone handle. Nickel silver bolster(s). Inlay shield. Boxed. Made in China. Steel Warrior. 4.13" closed. Mirror finish stainless clip and spey blades. 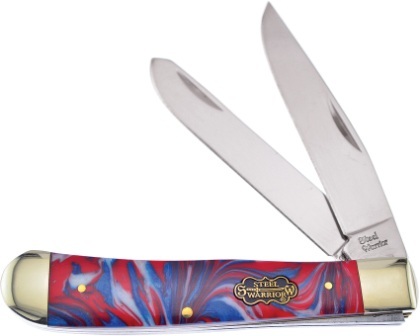 Red, white, and blue Corelon handle. Nickel silver bolster(s). Inlay shield. Boxed. Made in China. 4.13" closed. 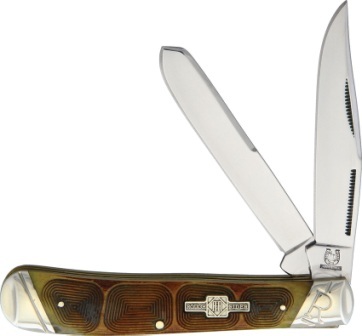 Mirror finish stainless clip and spey blades. Nickel silver bolster(s). Inlay shield. Bone and horn handle. Boxed. Made in China. Steel Warrior. 4.13" closed. Mirror finish stainless clip and spey blades. 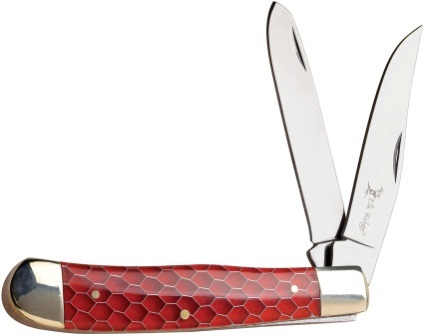 Red handle. Nickel silver bolster(s). Inlay shield. Honeycomb resin handle. Boxed. Made in China. Steel Warrior. 4.13" closed. Mirror finish stainless clip and spey blades. Ram's horn handle. Nickel silver bolster(s). Inlay shield. Boxed. Made in China. Steel Warrior. Trapper. 4.25" closed. Mirror finish stainless clip and spey blades. 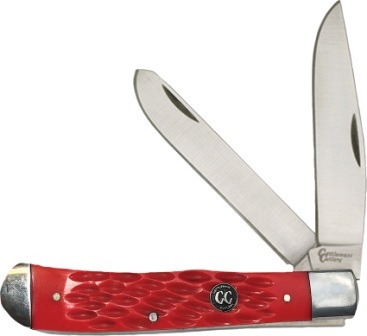 Red pick bone handle. Nickel silver bolster(s). Inlay shield. Boxed. Made in China. Steel Warrior. 4.13" closed. Mirror finish stainless clip and spey blades. 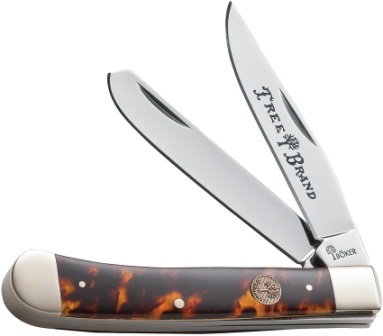 Imitation pearl handle. Nickel silver bolster(s). Inlay shield. Boxed. Made in China. Steel Warrior. 4.13" closed. Mirror finish stainless clip and spey blades. Bone handle. Nickel silver bolster(s). Inlay shield. 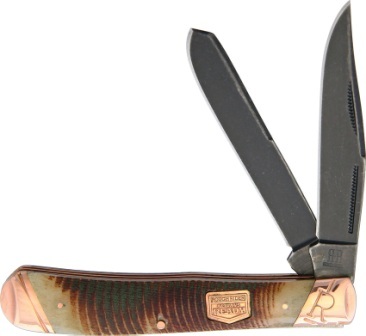 Tiger stripe handle. Boxed. Made in China. Steel Warrior. 4.13" closed. Mirror finish stainless clip and spey blades. Nickel silver bolster(s). Inlay shield. 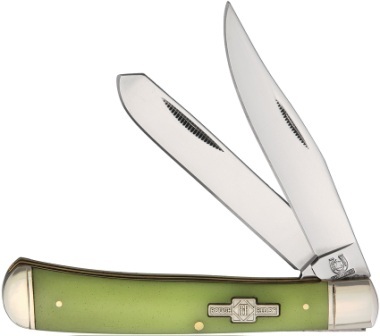 Green smooth bone and mother of pearl handle. Boxed. Made in China. Steel Warrior. 3.5" closed. Mirror finish stainless clip and spey blades. 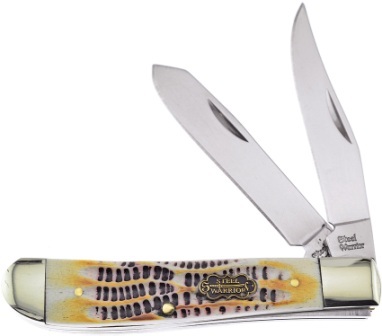 Autumn second cut bone handle. Nickel silver bolster(s). Inlay shield. Boxed. Made in China. Steel Warrior. 3.5" closed. Mirror finish stainless clip and spey blades. 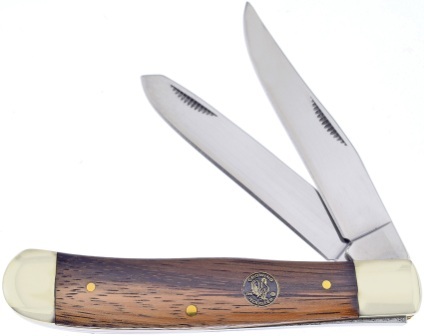 Buffalo horn handle. Nickel silver bolster(s). Inlay shield. Boxed. Made in China. Steel Warrior. 3.5" closed. Mirror finish stainless clip and spey blades. 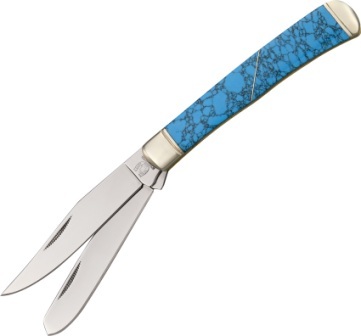 Blue jigged bone handle. Nickel silver bolster(s). Inlay shield. Boxed. Made in China. Steel Warrior. 3.5" closed. Mirror finish stainless clip and spey blades. Red jigged bone handle. Nickel silver bolster(s). Inlay shield. Boxed. Made in China. Steel Warrior. 3.5" closed. Mirror finish stainless clip and spey blades. 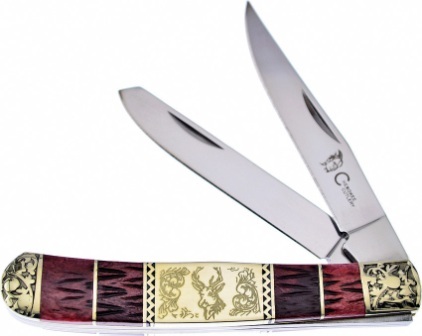 Ox horn handle. Nickel silver bolster(s). Inlay shield. Boxed. Made in China. Steel Warrior. 3.5" closed. Mirror finish stainless clip and spey blades. Ram's horn handle. Nickel silver bolster(s). Inlay shield. Boxed. Made in China. Steel Warrior. 3.5" closed. Mirror finish stainless clip and spey blades. 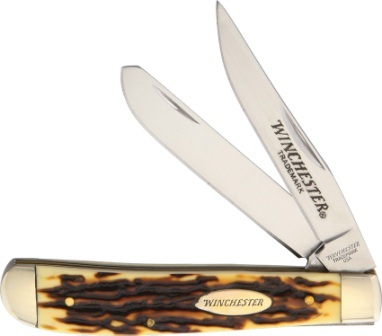 Winter aged bone handle. Nickel silver bolster(s). Inlay shield. Boxed. Made in China. 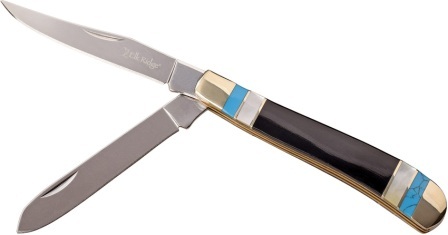 Wild Turkey Cutlery. 4.13" closed. Mirror finish stainless clip and spey blades. 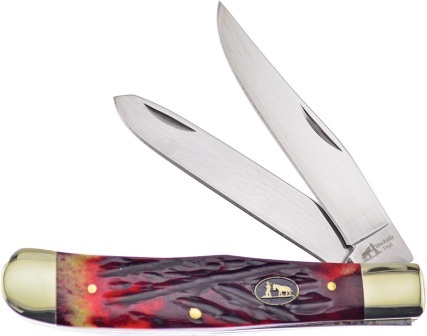 Buffalo horn handle. Nickel silver bolster(s). Inlay shield. Boxed. Made in China. 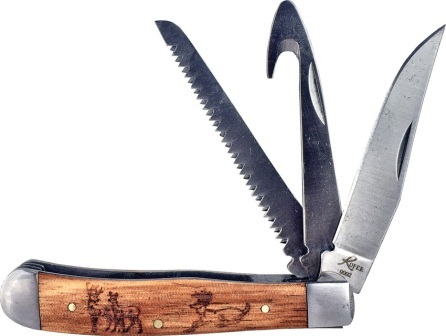 Wild Turkey Cutlery. 4.13" closed. Mirror finish stainless clip and spey blades. Whiskey resin handle. Nickel silver bolster(s). Inlay shield. Boxed. Made in China. 4" closed. 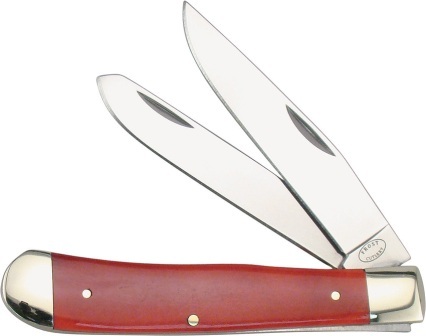 Stainless clip and spey blades. 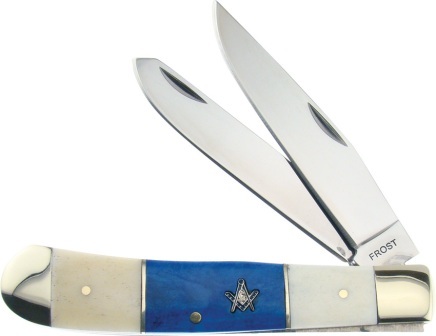 Red, white and blue composition handles with nickel silver bolsters and star inlay shield. Made in China. 3 1/2" closed. 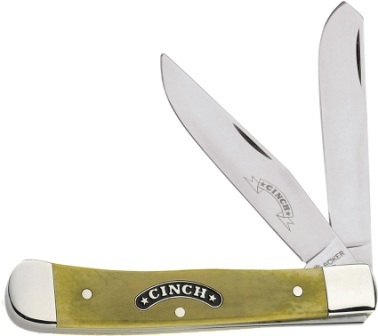 Stainless clip and spey blades. 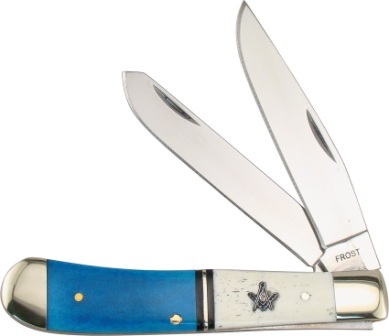 Red, white and blue composition handles with nickel silver bolsters and star inlay shield. Made in China. 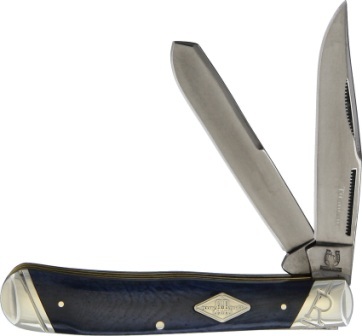 4 1/8" closed pocket knife. Stainless clip and modified spey blades. 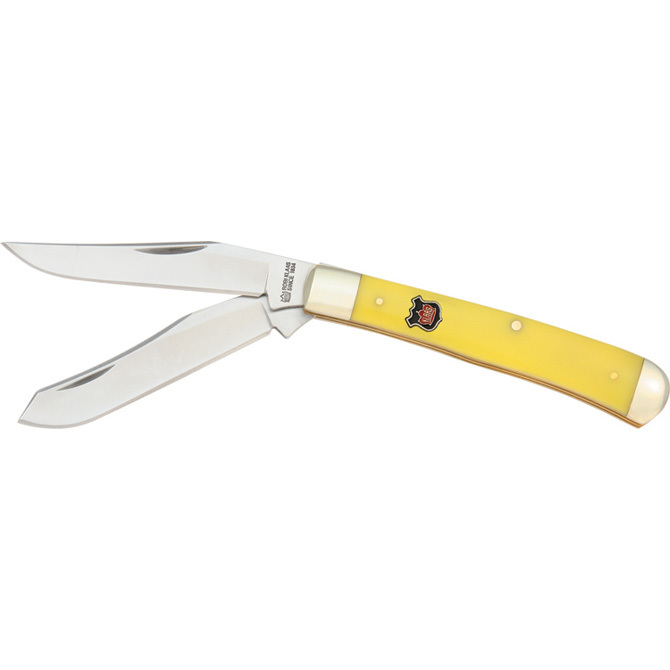 Yellow composition handles with nickel silver bolsters and inlay shield. Made in China. 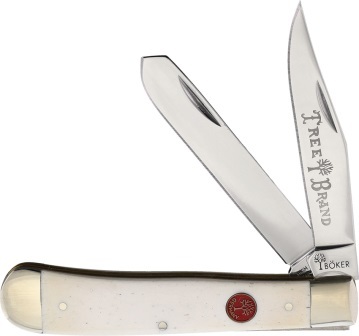 Type: Trapper; Closed: 4.5"; Blade: Stainless | Standard Edge | Mirror Polish Finish; Handle: Synthetic; Other Info: Inlay Shield | Nickel Silver Bolsters. Clip and spey blades. Handle features wood duck artwork by L.W. Duke under acrylic and Marbles duck shield. Comes with two piece display decoy. Boxed. Made in China. 4.13" closed. 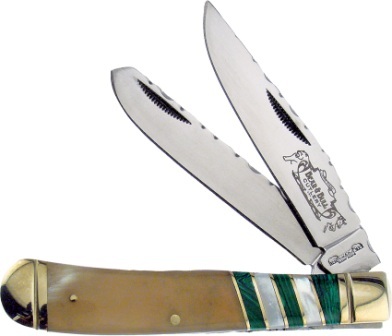 Stainless clip and spey blades. 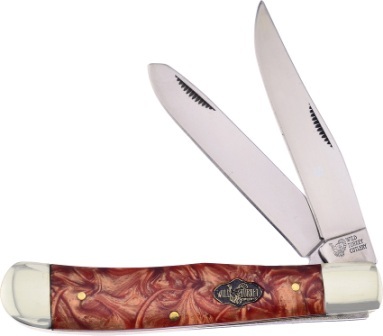 Imitation stag handle. Nickel silver bolster(s). Inlay shield. Boxed. Made in China. 3.5" closed. 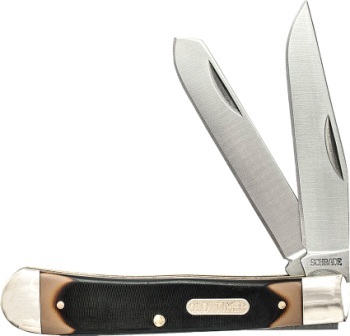 Satin finish 1065 carbon steel clip and spey blades. 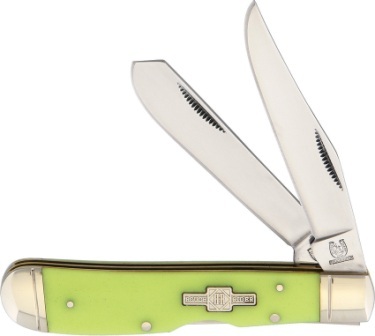 Green jigged bone handle. Stainless bolster(s). Inlay shield. Boxed. Made in China. 4.13" closed. 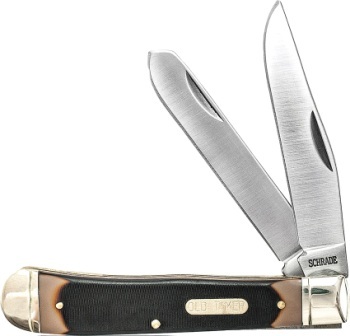 Satin finish 1065 carbon steel clip, saw, and guthook blades. Zebra wood handle. Stainless bolster(s). Boxed. Made in China. Uncle Henry. 4" closed. 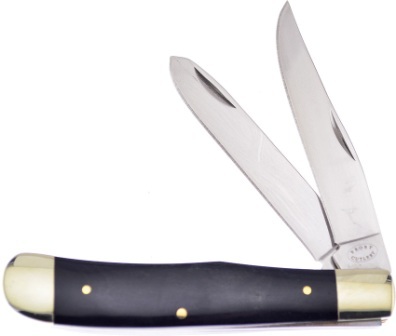 Stainless clip and spey blades. 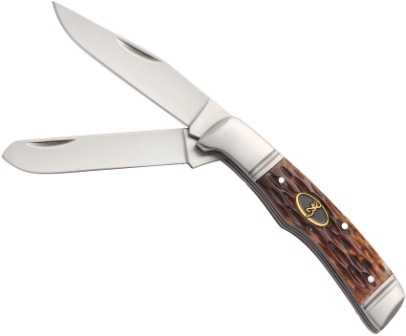 Staglon handle. Nickel silver bolster(s). Inlay shield. Clam packed. Made in China. 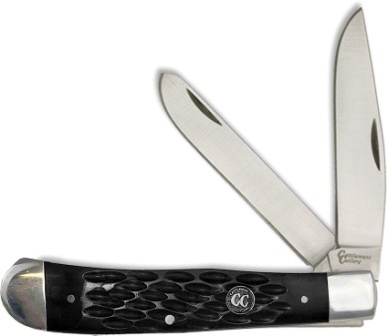 Closed: 4.125"; Blade: 7Cr17 High Carbon Stainless | Standard Edge | Satin Finish; Handle: Brown | Synthetic; Other Info: Inlay Shield | Nickel Silver Bolsters. Clip and spey blades. Boxed. Made in China. 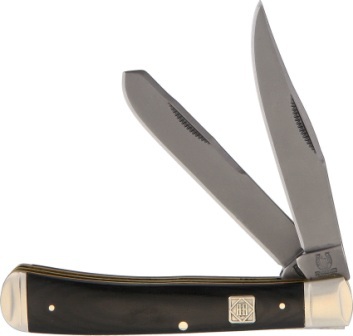 Closed: 4.125"; Blade: 7Cr17 High Carbon Stainless | Standard Edge | Satin Finish; Handle: Brown | Synthetic; Other Info: Inlay Shield | Nickel Silver Bolsters. Boxed. Made in China. 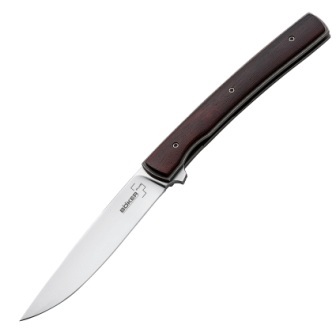 Closed: 4.125"; Blade: 7Cr17 High Carbon Stainless | Standard Edge | Satin Finish; Handle: Brown | Synthetic; Other Info: Inlay Shield | Nickel Silver Bolsters. 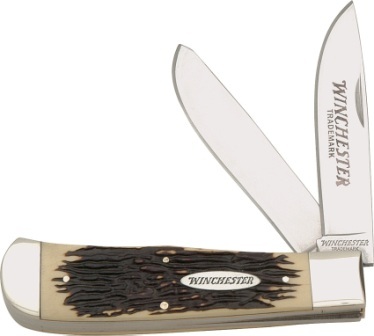 Clip blade and hoof pick. Boxed. Made in China. 3.5" closed. Satin finish stainless clip and spey blades. 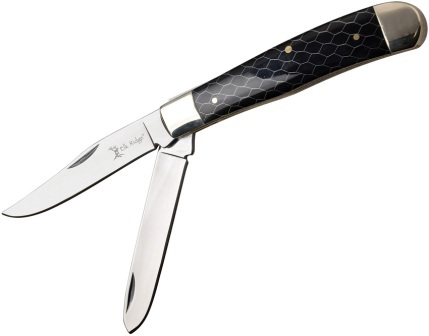 Black synthetic handle. Stainless bolster(s). Blade etching. Inlay shield. Metal gift tin. Clam packed. Made in China. 7Cr17MoV stainless clip and spey blades. Sawcut Delrin handle. Nickel silver bolster(s). Inlay shield. 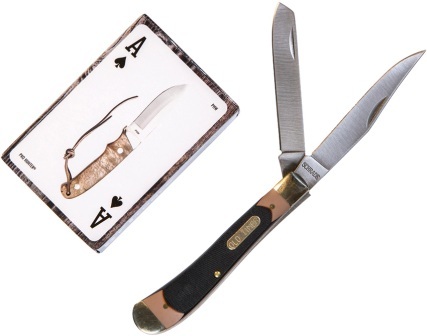 Includes 52 card custom deck with 2 jokers and features 13 of the top Old Timer knives. Clam packed. Made in China. 4.13" closed. mirror finish stainless clip and spey blades. 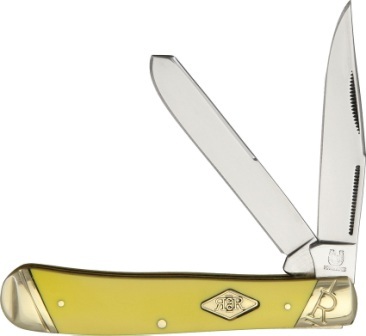 Yellow smooth synthetic handle. nickel silver bolster(s). Inlay shield. Boxed. Made in China. 3.5" closed. 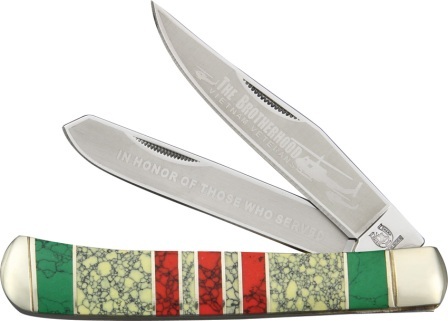 Mirror finish clip and spey blades. 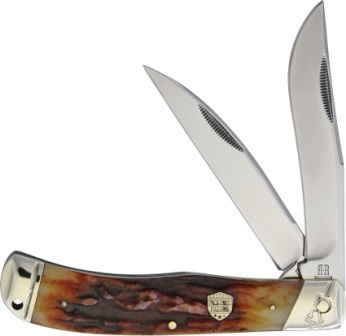 Imitation stag handle. Nickel silver bolster(s). Inlay shield. Clam packed. Made in China. 3.5" closed. mirror finish stainless clip and spey blades. 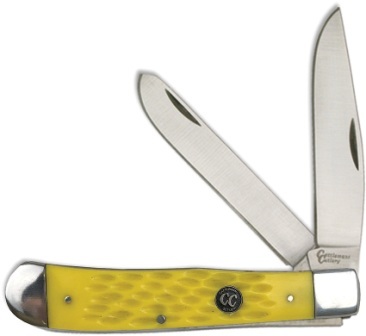 Yellow smooth synthetic handle. nickel silver bolster(s). Inlay shield. Boxed. Made in China. 3.5" closed. mirror finish stainless clip and spey blades. 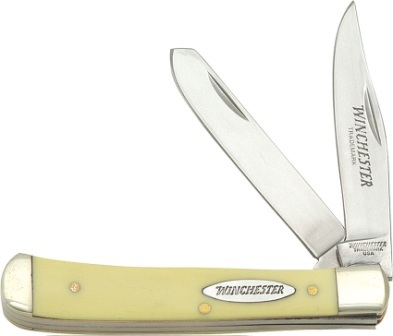 Yellow smooth synthetic handle. nickel silver bolster(s). Inlay shield. Clam packed. Made in China. 4.5" closed. mirror finish stainless clip and spey blades. 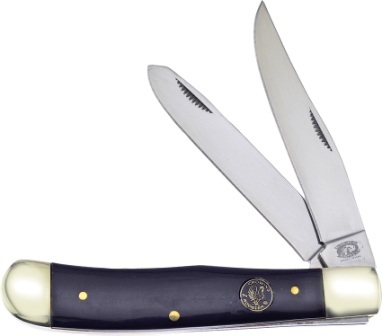 Imitation stag handle. nickel silver bolster(s). Inlay shield. Black Cordura pouch. Clam packed. Made in China. 4.5" closed. mirror finish stainless clip and spey blades. 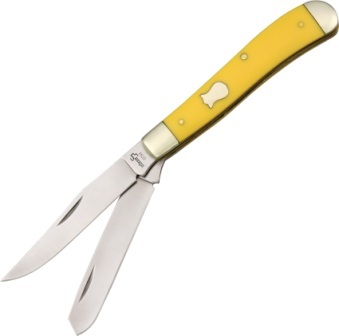 Yellow smooth synthetic handle. nickel silver bolster(s). Inlay shield. Black Cordura pouch. Clam packed. Made in China. 4.5" closed. mirror finish stainless clip and spey blades. 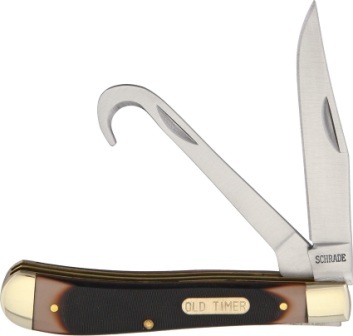 imitation stag handle. nickel silver bolster(s). Inlay shield. Black Cordura pouch. Boxed. Made in China. 4.5" closed. mirror finish stainless clip and spey blades. 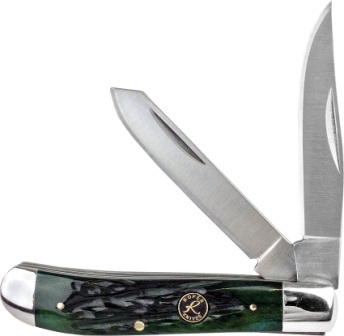 imitation stag handle. nickel silver bolster(s). Black Cordura pouch. Clam packed. Made in China. 4" closed. 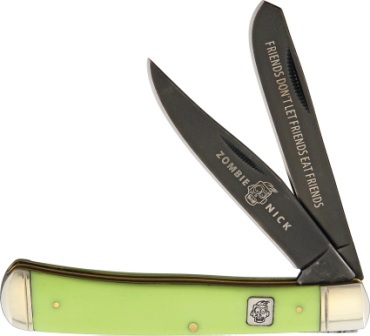 Mirror finish clip and spey blades. 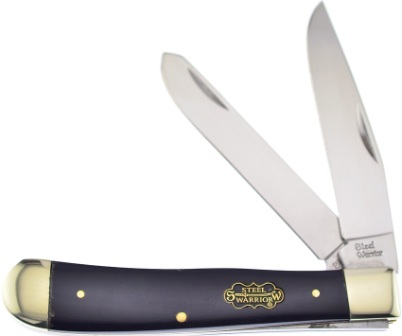 Imitation stag handle. Nickel silver bolster(s). Inlay shield. Boxed. Made in China.